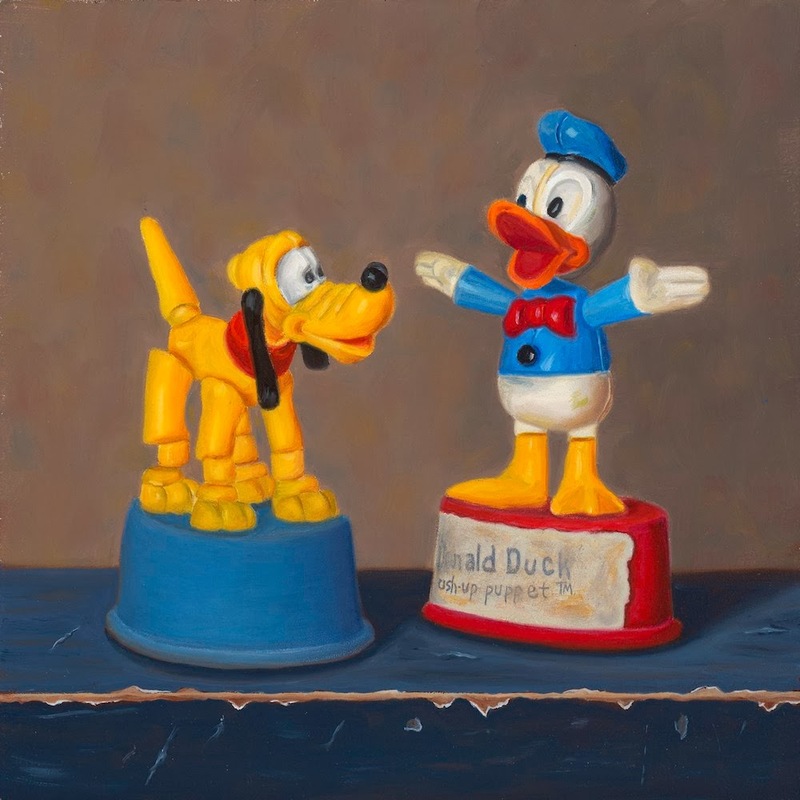 To enter to win Susan's painting, "Donald Preaches" go to Daily Paintworks and click on the link at the top of the page announcing her interview. Welcome! 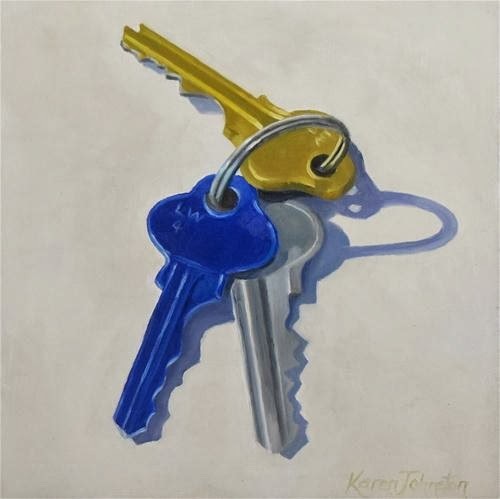 ​I have been painting for some twelve years and am largely self-taught. 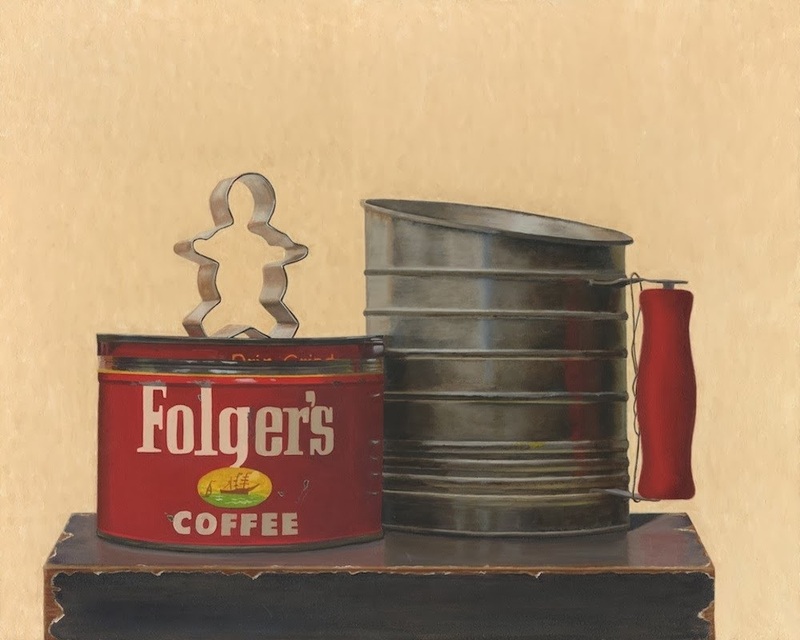 My concentration is on realistic still life, with works done in both oil and pastel. I sell all my originals and offer excellent quality art reproductions as well. 100% of all my sales, both originals and giclee prints, go to benefit Youth for Christ Spokane, a local non-profit that reaches out to impoverished and at-risk youth. I am sixty years old and I had absolutely no interest at all in art for 47 years. 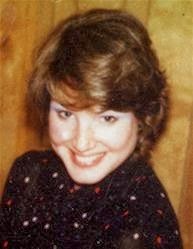 My mother had always painted, she's the best painter I know, but with raising five children alone, had time to do very little. When she retired she took it up once again, and urged me to give it a try. I told her endlessly that it was hopeless; I would be a miserable failure. She did not give up, and finally I gave it a try once while visiting her and was hooked immediately. My mother and I then spent several years traveling to workshops given by contemporary masters, such as Daniel Greene and Michael Shane Neal, which helped tremendously. Note to Mom: So when are you going to join DPW??? She would break all the records in sales. In 1996, I almost gave up painting as everything I produced looked awful to me. Then I was reading that many of the old masters copied works by others they admired, and I figured if it worked for them, I should try it too. So I decided to do nothing by copy works by artists I admired for a year. It worked wonders. I learned more than I can believe. You don't really study a work till you copy it. Obviously, I can't show the works, but the year of studied copying was so valuable to me. I started out in watercolor because it looked easy. How wrong I was. I finally gave up in frustration and turned to oil, which I continue to love. I have recently expanded to pastel. 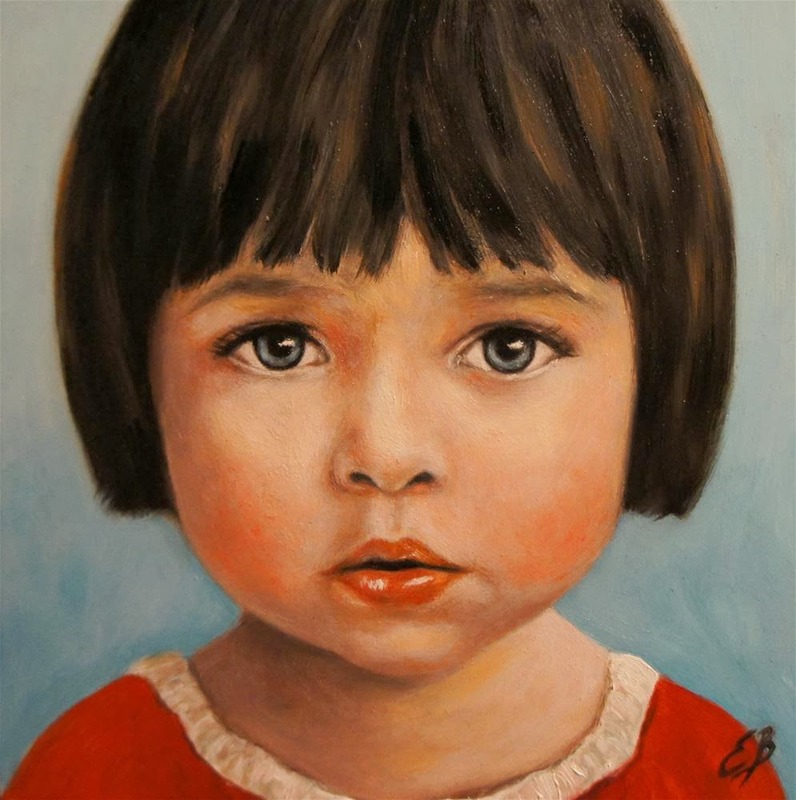 As for genres, I began with portraiture, because my mother was doing it. I loved it, but it was too exacting. Now I just do still life. Portraiture fell away because, as John Singer Sargent said, "portraiture is a still life with something wrong with the mouth." Don't need that. I continue to love still life. It doesn't have opinions. And I don't have to battle the elements that landscape artists battle. I'm too big of a wimp for that. Nothing, to tell you the truth. I love my ruts. And I love still life. I've also formally given up on loosening up. It's not for me. I tried and was a miserable failure. I guess I have too uptight a personality for that! Its really freeing to figure out your own style rather than what you "should" do. Looking through the artwork of other contemporary artists. I never cease to be amazed at the beauty they find in ordinary objects. It is the story of my life. I have a high work ethic, and painting is fun, so I rationalize it as "work before play," which is baloney, in my case. I find I procrastinate a lot less if I have a deadline. Deadlines are good for me. Also, having a pastel in progress is critical. I can work on it for only ten minutes, but that ten minutes is so productive because I see the work and the problems with fresh eyes. Every time I walk into my studio I always wind up saying "I can't believe I did that..." because the problems just jump out at me. Being a perfectionist, I want to fix problems, and if I have a pastel in progress, I know I can fix something in just ten minutes. Pastel. I mean it. I find I can't paint more than a half hour to an hour a lot of days, and mixing my oils and cleaning up makes no sense on those days. So I took up pastel, and find even if I have only ten minutes, it is a highly productive ten minutes. If I have a lot of time in a day, I work on my oils. I am the least creative person you will ever meet. I love the internet for that reason, as well as art magazines. I look through DPW every day for ideas. I don't copy the ideas, but am amazed at the creative things people paint and then use that idea to come up with a similar idea that works for me. I just keep looking for ideas I have gleaned from others and then adapt them to my own style. That keeps me fresh. I don't think I have ever painted the same object twice. That helps as well. The same things that have bogged me since I started painting; I am finally started to figure them out. My two problem areas are values and shapes. I discovered if I look at my painting from a very far distance, say 30 feet, it screams out its problems. Or take a photo of it and shrink it to a thumbnail on the computer and look at it. You just see the big shapes and values then. I'm often horrified with what I see. When I complete a piece I am really proud of. I wasn't proud of my art for a long time. The last eighteen months, I feel I have really turned a corner and am genuinely proud of it. It also really helps when my biggest fans and biggest critics, my husband and sons, like what I do. Even better is when they request that they have it to hang in their own homes and offices! Also, I finally had the gumption to agree to a solo show recently, my first. I was terrified no one would come, and if they did, no one would buy. The place was packed and there was a line at the cash resister. I was stunned and thrilled; it made me realize people really like my work! Now friends are asking to hang my art in their places of business, which really thrills me. 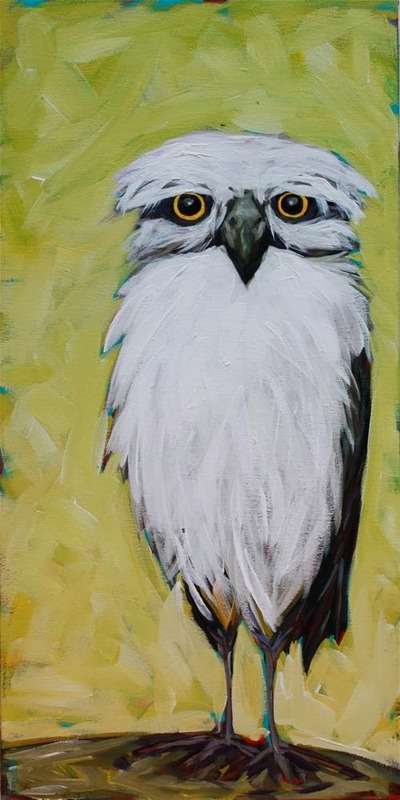 To enter to win Kandice's painting, "Ned" go to Daily Paintworks and click on the link at the top of the page announcing her interview. 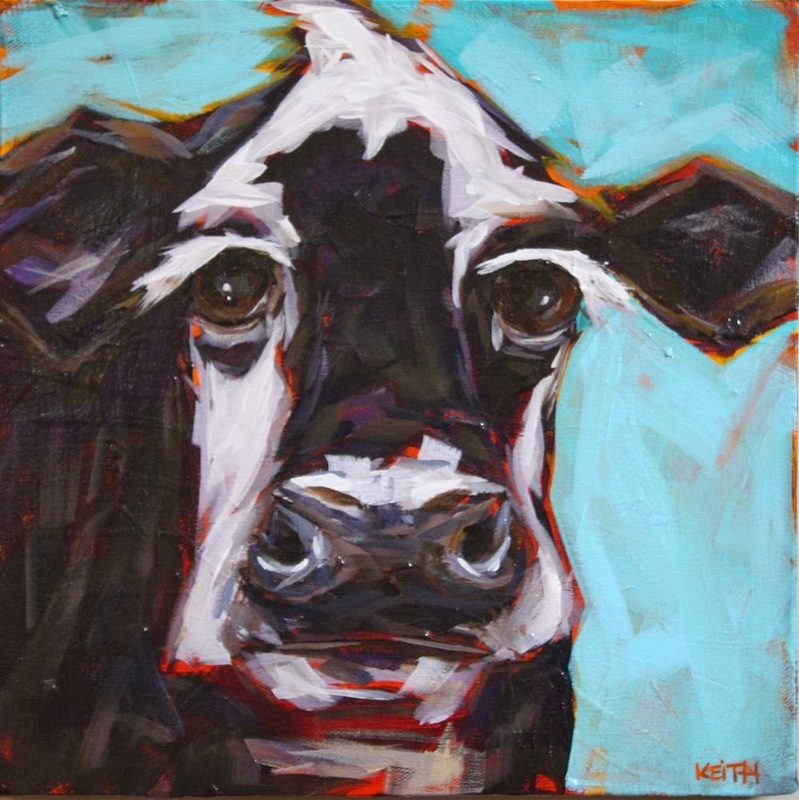 Kandice Keith is a contemporary acrylic painter living in Squamish, BC. Kandice first starting painting with acrylics in 2002, but her passion and appreciation for art began much earlier. 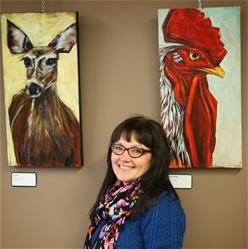 Growing up in Winnipeg, Manitoba, she spent much of her childhood at the family cottage where she received the support of a creative extended family. At the age of eighteen, Kandice relocated to the West Coast, but never lost touch with those early influences - the beautiful prairies and a love for creating. I have a pretty artistic family. I can't remember a time in my life when I wasn't creating one thing or another. Painting was just something I always wanted to try. In 2002, I asked for a painters kit for Christmas and enrolled in a workshop that was suggested to me by the local art supply store. I can't say I have had any breaks. I worry when we go on vacation about how I will manage being away from my studio and not being able to paint. I've had more "blocks" than stops and starts I'd say. I've always worked in acrylics. I've tried acrylics that mimic oils and I really struggled with them. Fluid and full body acrylics is what I particularly like working with. I tend to use fluid acrylics for my darker or cooler tones, and full body paint for my warmer colours. I'm not sure why. Every once in a while I feel tempted to try oils. My only reason for this would be the negative judgement I sometimes feel by other artists for using acrylics, and to try something new. I just don't think my patience could handle the slow drying nature of oils, and I'd probably make a bigger mess than what I do with the acrylics. Enter to win by clicking on the link at the top of the home page announcing Kandice's interview. For the most of my artistic career, I painted using a square/pointillism technique. Gradually, I've unconsciously been dropping the squares, and now I aim for a looser look. For the first 10 years of painting, I also strictly painted landscapes. I think I was too scared to try anything else, but was getting frustrated painting landscapes in my current style. The squares were feeling restrictive, tight and took forever to paint. 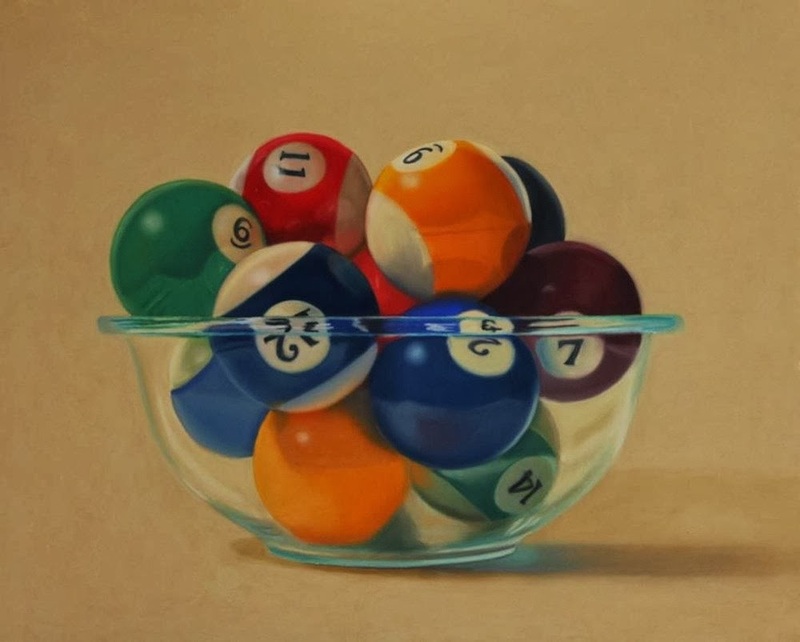 In 2011, I decided that if I wanted to improve as an artist, the best way improve would be to try still life. I have seen other artists rapidly improve their skills by painting apples and oranges again and again. 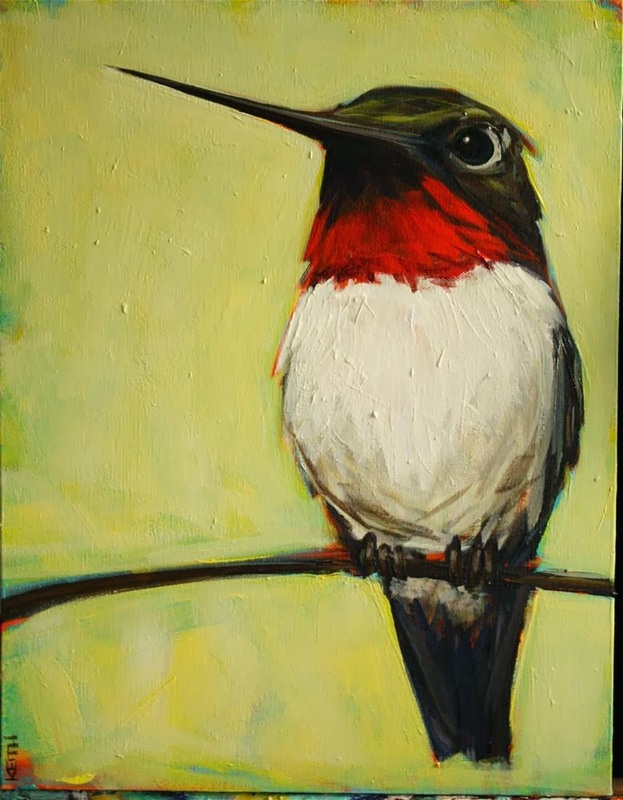 In the spring of 2013, I thought I'd reach even further out of my comfort zone and try painting a hummingbird. 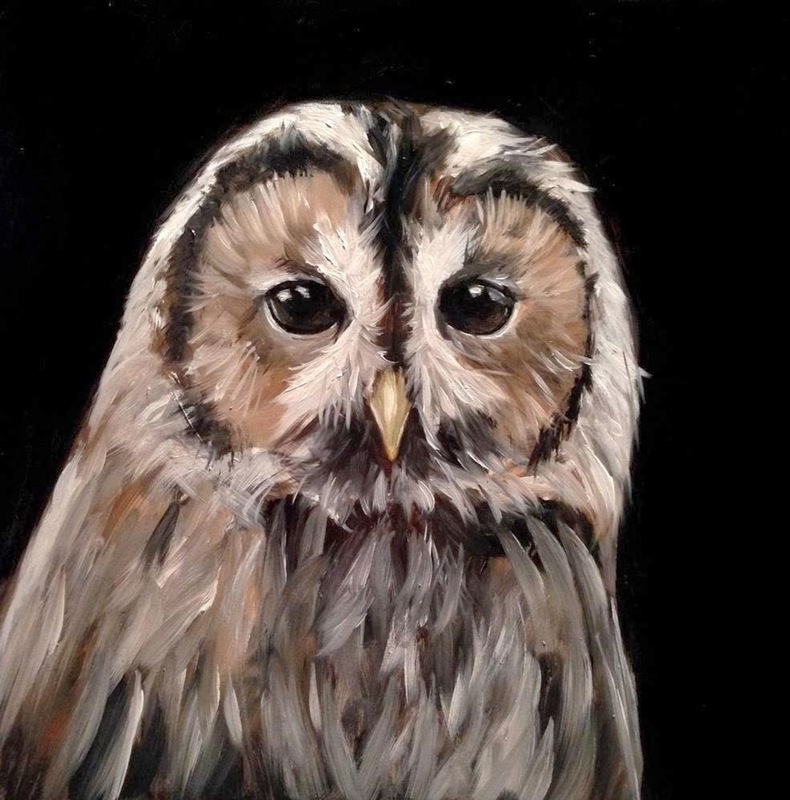 Now, I'm painting all sorts of animals/birds and loving it. It brings back happy childhood memories and somehow makes me feel like a kid again. 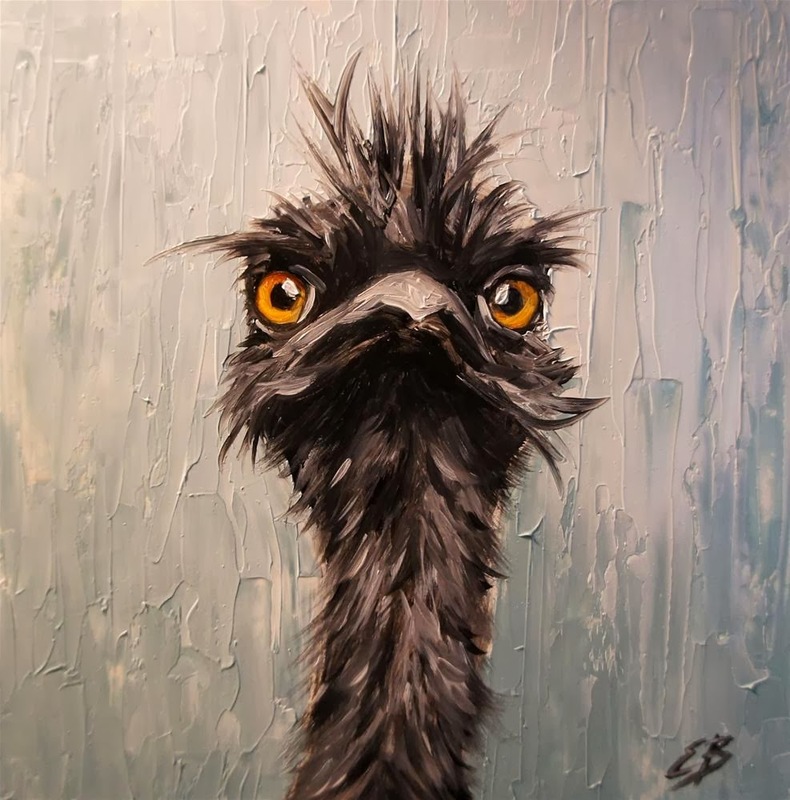 I love the personality and character out of the animals I paint and I can't see myself veering from it anytime soon. I'm currently working on some owls using a similar composition. I love to be able to explore using different backgrounds and seeing how they compare with their surrounding colours, and the different looks of each bird. I often like to paint the same reference photo over and over again, as I find it has proven to be the best way for me to grow and improve as an artist. 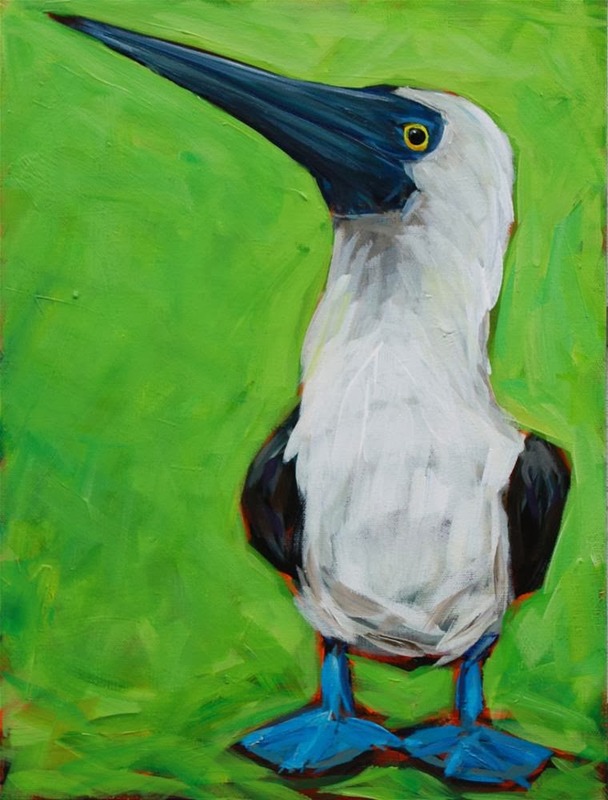 I look forward to exploring more animals, different kind of birds, maybe some sea life and hopefully more pet portraits. Family, nature and my surroundings in Squamish, BC. It's not unusual for me to see a bear in my yard, eagles or herons flying above, and I can hear the cows and roosters from the farm next door. I wouldn't say I procrastinate much when it comes to painting, but I often get held up by fear. Fear that the piece is going really well and I might wreck it if I go further. Or fear that I like it and nobody else will, judgement, etc. I usually will hang the partially or almost completed piece up until I get the courage to finish it up. I might take weeks, months or even years to go back to it (if I even go back to it at all). I think I get a bit obsessive with my art and I always make time to paint (often at the sacrifice of other things around my house). Even if I only have a few moments, I might quickly sketch out a piece, prep a canvas, or lay a layer of glaze. Being a busy mom of three, I try and "steal" every moment I can ( I'm fortunate that my studio is just next to my toy room ). I usually paint during nap time, and I will often use a timer while I paint. I find I do my best work when I have to work quickly and stay in the moment. I never seem to run short of ideas for paintings. I have sticky notes, and reference photos everywhere! Generally, I really try and listen to that inner voice when I think to myself, "I should try and paint a dog." It's amazing where that can lead. I've also been doing a few commissions lately. I feel honoured when someone wants a painting from one of their precious photos, usually of a sentimental subject. I enjoy the challenge of trying to incorporate their preferences, and I've learned a lot from the process. I work hard at trying to push myself out of my comfort zone all the time, either in the business side of things or the actually paintings themselves. When I feel fear about trying something new, I know that I have to try it. I think it's the competitive side of me that keeps me going. Plus, painting is what I do to avoid burnout in the rest of my life. Painting is what I do to relieve my stress, feel good, and "fill my bucket" as my six-year-old daughter would say. I also find it helps to listen to the most energizing music and dance while I paint; I'm sure I'm quite the sight! I feel like I learn both emotionally and skillfully with each piece I paint. I'm trying to focus my attention on growing my art career, so I have to tackle some pretty big emotional fears and confidence issues to try and sell my work. I know that if I want to earn an income from my art, I better get over those issues pretty quickly and get used to stepping out of my comfort zone. As an artist, I feel like I've matured immensely over the past year and I attribute much of that to my painting daily. I love the feeling I get the day after a successful late night in the studio. It's almost like Christmas morning when I wake up: I get excited, and quickly go check on the pieces from the night before to make sure that they were as good as I remembered. I may be tired, but I feel revived from a night of being in the zone, and a feeling of accomplishment from a piece. That makes me smile. 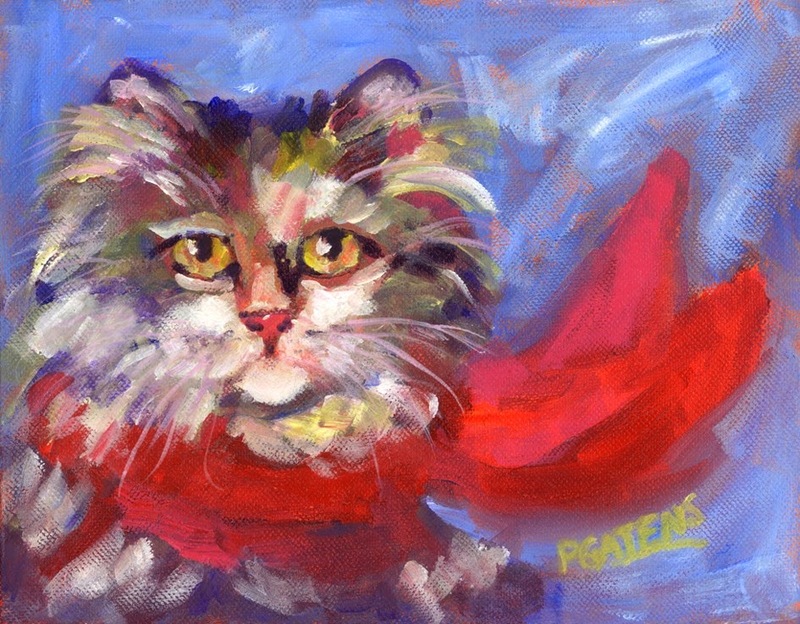 To enter to win Pamela's painting, "Meow's New Muffler" go to Daily Paintworks and click on the link at the top of the page announcing her interview. 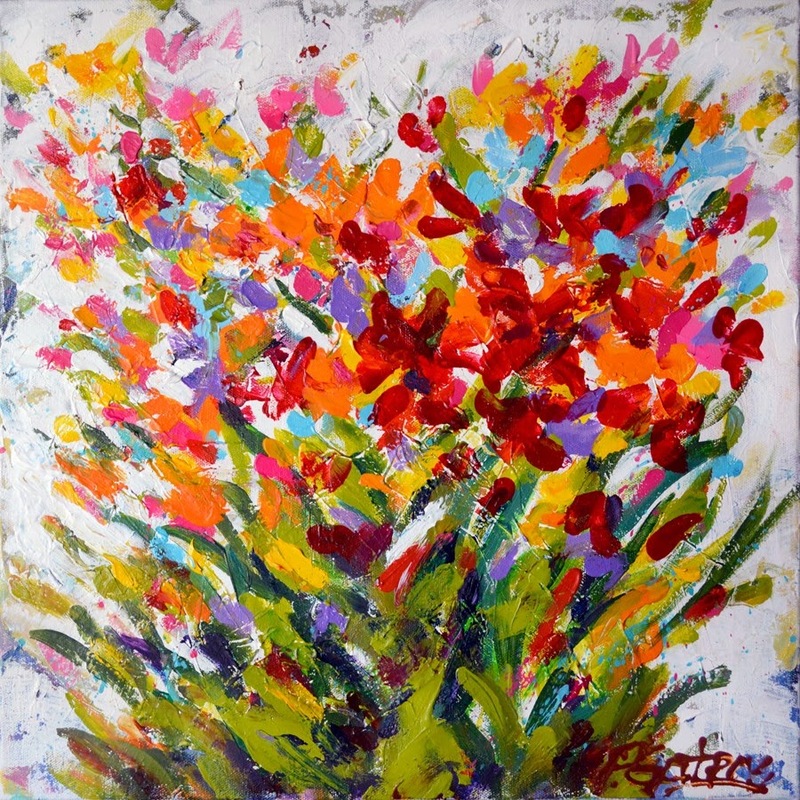 Pamela Gatens is an artist in the impressionist style. 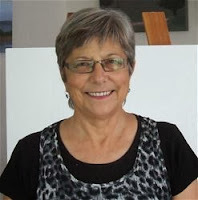 Working in acrylic and watercolor, she is a prolific painter and entertaining teacher. Pamela is also a Signature Member of the West Virginia Watercolor Society. She sells her work at The Greenbrier Hotel & Resort, online, and at Tamarack in Beckley, West Virginia. Her line of cat and floral cards have been best sellers for years. 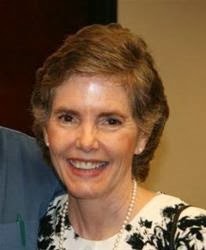 Pamela lives in Hillsboro, West Virginia with her husband Pat, dog Barker, and cats Pokey and Mack. I can't remember a time when I didn't have a crayon or pencil or paintbrush in my hand. I come from a family of creative people, so art was a natural way of life for us. My early working career was in typesetting and graphic art. My first job in high school was at a little newspaper in Dallas, where the owner taught me to set type on little strips of photographic paper and then do a "paste-up" of the newspaper page. It was probably a good lesson in painting composition, I just didn't know it. Every job I held after that was related in some way to graphic art, design or printing. 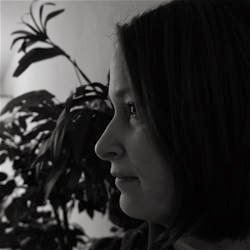 My husband and I owned a graphic design business in California for almost twenty years. When we moved to West Virginia eleven years ago, I said I would start painting "seriously" - and I did. We were always so busy with our business in Los Angeles, my painting times were extremely limited. But since moving to West Virginia I've been painting steadily through thick and thin! Enter to win by clicking on the link at the top of the home page announcing Pamela's interview. I paint now in watercolor and acrylic, mostly acrylic on canvas. I have tried oils and dabbled in mixed media including some pastel work. And if we go back a little ways, there was stained glass, ceramics, sculpture, teddybear making, lampworking, jewelry making, scroll sawing, knitting, yarn dyeing and spinning, soapmaking, fabric dyeing, and of course, sewing. I always threatened my husband that I would take up welding if he wasn't careful! 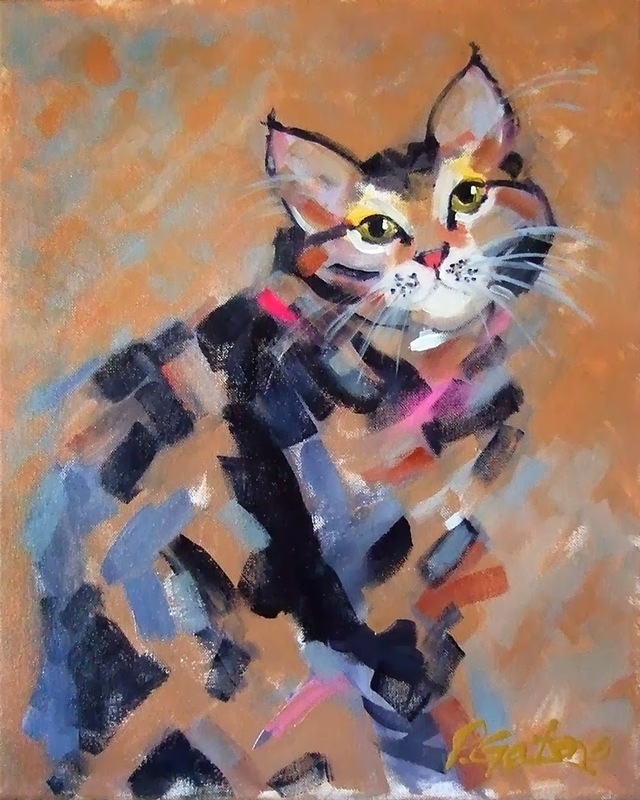 Subject matter has always been cats, flowers and abstracts for me. I don't know why it took me so long to settle on painting, but I am definitely hooked on water media with no chance of rehab! My kiln and wheel, along with my glass and torch have sat idle now for some time, as has the sewing machine and bottles of dye. I'll stick with acrylics for now. Oils have been waiting in the wings for some time, eventually I'm sure they will come into play. I also have interest in combining crayons with poured fluid acrylics and acrylic inks in my abstracts. 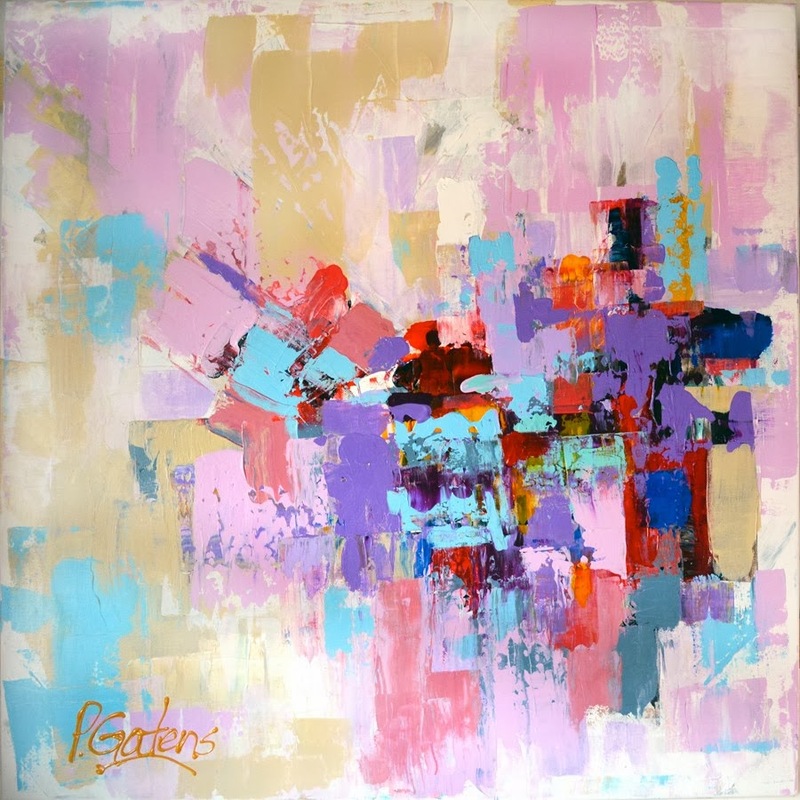 I really want to explore larger abstract works and the figure. I love color, and take great delight in using lots of it. That's where it always starts with me. Both watercolor and acrylic are very spontaneous mediums and I love the randomness of it all. Impressionism is high on my list, as is Abstract Expressionism. I really get a thrill out of a nicely placed brushstroke on the canvas. I am constantly looking for and thinking about new color combinations, and how they can be applied to a new painting subject. 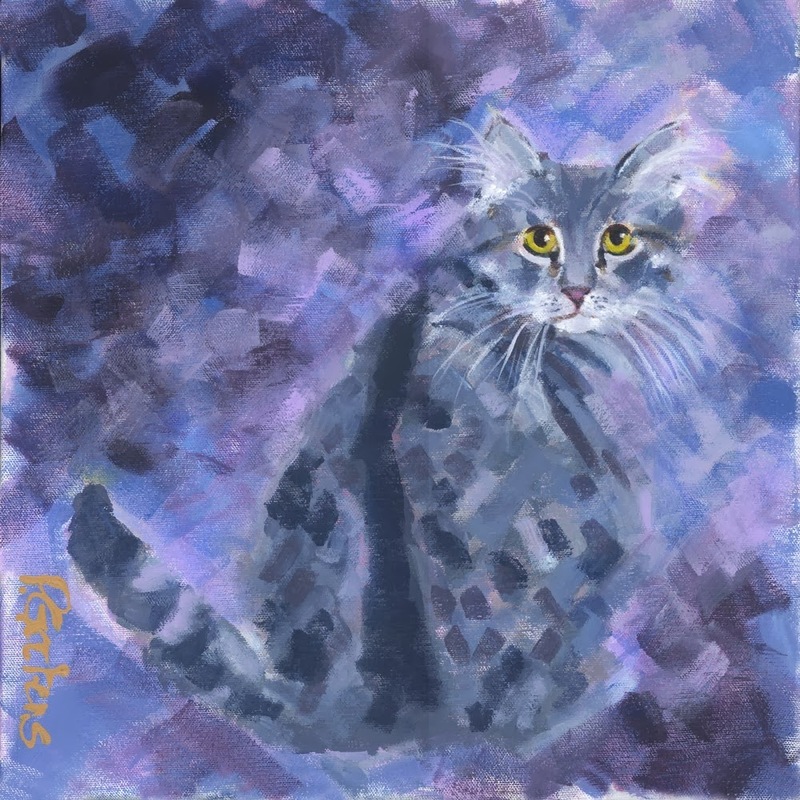 Cats, too, are always in the back of my mind, tempting me to paint yet another one! I win the prize when it comes to procrastination. From birth, I have just been the worst! 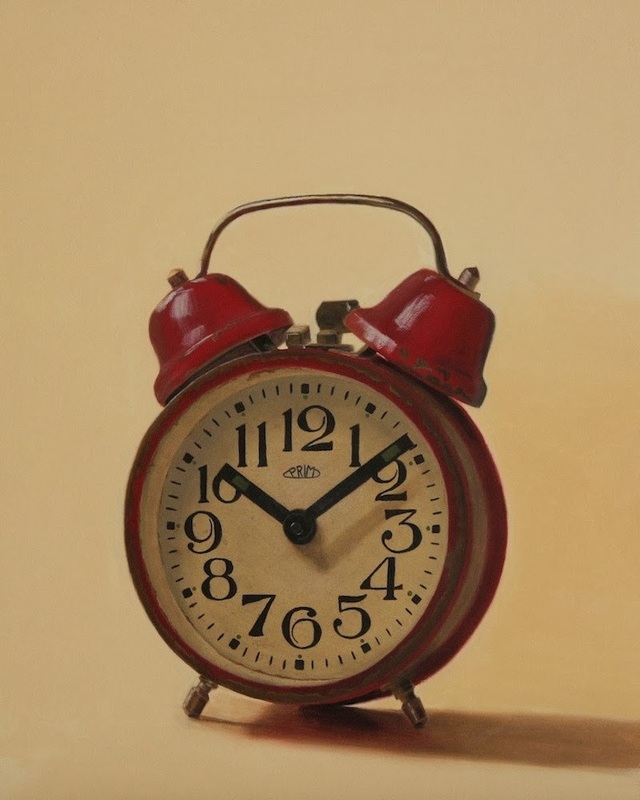 My entire working career was in a deadline oriented business, which meant that everything was time sensitive. I have been accused of waiting until the last minute for everything, then seeing how fast I could get it done. Never a dull moment around our house! I paint everyday, or at least I spend very few days without wet paint on canvas. Living out in the country in West Virginia is the perfect place to concentrate on painting. No neighbors, only the bears and the birds. I try to minimize my online time, which is hard since it is my main source of study and research. I'm a morning person, so I try to paint first thing. I have learned that if the painting mood strikes, I'd better answer it and get in front of the canvas fast - no matter what time it is. Late afternoons and evenings are for the computer and reading or watching my painting videos for the umpteenth time. My sweet husband is long suffering when it comes to housework and will eat most anything I find the time to cook! Cats come easily - people are always emailing me photos of their cats, so reference material is never lacking. I never get tired of looking at cat photos. Florals, which I love to paint, are either from life or a conglomeration of different bouquets - mixed bouquets being my all time favorite to paint. I daydream a lot about painting, so I try to channel my "meditation" into imaginary paintings. I read and study a lot. If I can't figure out how to do something, I spend the time to find out what it is I'm doing wrong, or NOT doing in most cases. Everyone has their own funny little techniques - and I love to read interesting blog posts and books on others' techniques. Being self taught is an ongoing challenge - you become both teacher and student. I also challenge myself to find new paint mixtures from a limited palette. Color needs unending study, and is my favorite subject. The best advice I ever read was "find what you do well, then do it better." I always think I've finally settled on my "forever" palette, then discover I must tweak one of my blues to a different one, or eliminate a color because it no longer works in my color schemes. And I am reminded everyday how far I have to go in my art journey, as corny as that sounds! My colorful paintings come from the true happiness I feel in front of the easel. There is nothing I would rather do than paint - so I guess it's just the actual process that makes me the happiest. They say if you can lose yourself in something, lose track of time and enter your own world, you should stick with it. That's what painting is for me. 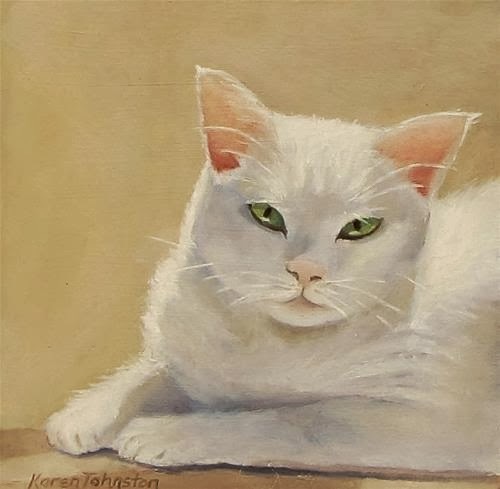 It also makes me happy to see the light in people's eyes when they see one of my cat paintings. To enter to win Elizabeth's painting, "Untitled" go to Daily Paintworks and click on the link at the top of the page announcing her interview. 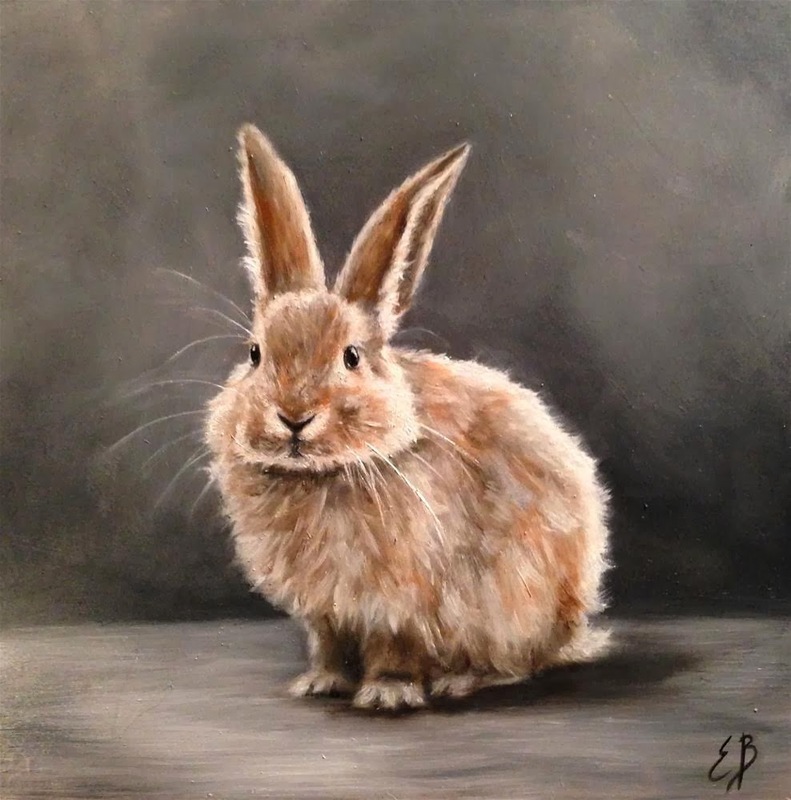 Elizabeth Barrett has enjoyed a passion for painting since early childhood. She has developed much of her artistic skill and style from self-education and practice. 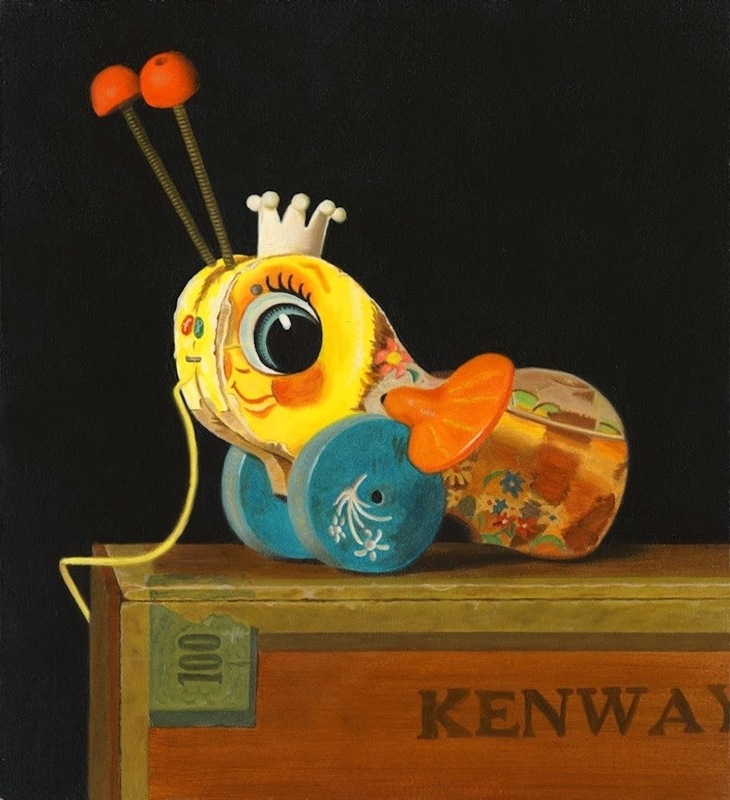 She is especially gifted at painting portraits and still life. Barrett captures the essence of a person or animal largely through facial expression, lighting, and highly crafted detail. Currently focusing her art on the old master’s technique, she incorporates years of painting experience using a variety of methods. My passion for art began in 6th grade. I remember seeing a classmate draw a picture of an island and the ocean. This inspired me to learn how to draw. My first painting was a landscape I did in 7th grade. I loved to search through magazines to practice drawing and painting from references. Raising 4 boys kept me busy! I used to only paint a few paintings a year. Now that they are older I am pouring more time into my work. Enter to win by clicking on the link at the top of the home page announcing Beth's interview. As a child, I wanted to experiment in every area. I used acrylic, watercolor, charcoal, pen/ink and pastels. I also tried sculpting and pottery. I loved the contrast when using charcoal along with white chalk on toned paper. I did a lot more drawing and less painting when younger. Pen and ink was also a favorite of mine. I taught art for a few years and tried to bring every medium into the classroom. 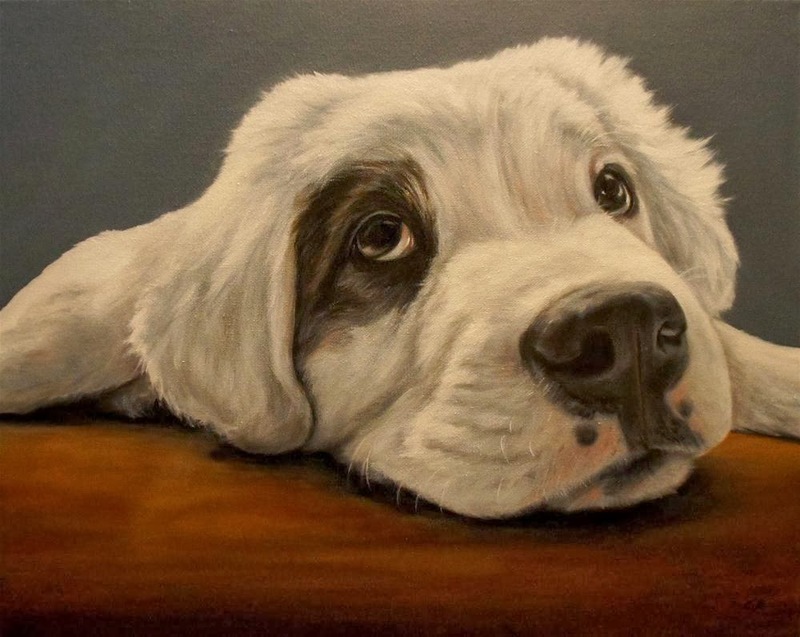 Currently, I only work in oils and paint pet portraits, animals, still life, and figures/portraits. Once in awhile I will paint a landscape. About twenty years ago, I purchased a Bob Ross paint kit and moved into oils. I never went back to painting with acrylic. My goal has always been to learn how to paint in realism. I found this was easiest using oils. I also like the opposite look of using a palette knife. It has been a long time since I have done drawings. Recently I have thought about getting back into creating charcoal drawings. Above all, creation inspires me the most. I love to paint animals with character and people. I think the Lord laughed many times as he created. Every day something catches my eye that I would love to paint. As far as artists go, Bouguereau has been a great inspiration for me. 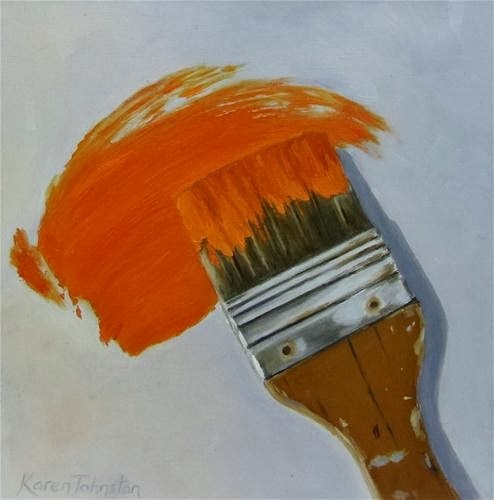 He has been one of many artists I have studied to learn the techniques in painting. There is always something else to do... a TV series to watch, recipes to try, Pinterest to search. It is always more fulfilling to focus on my work and get a lot done. I try to limit my computer time and stay focused on my work. It is a battle between learning and working. If I am busy all day, I make sure to make time in the evening to paint. Usually, it will be something that I see that inspires me to paint it. My eye is always on the lookout for interesting subjects with a lot of character. I also like to paint visions and dreams. This is an area I plan to do more of in the future. Up until now, I have mostly painted people and animals. I really enjoy painting still life and plan to set up an area in my home to make it easier to paint them. Before finishing a painting, I always put it away for a day and come back to it the next day to do the final touches. Sometimes walking away from a painting and coming back to it will give you more perspective on improvements that can be made. I like to “turn the lights on” by strengthening the highlights and shadows as I add details. I am always working on more than one painting at a time. I give myself plenty of breaks as I work through the layers. I am pretty much a self taught artist. I took a couple of art classes, but most of what I know is from research and practice. I like to study the techniques and the paintings of the old masters. I will always be in the process of learning and improving my techniques. I am very blessed to have a gift that allows me to paint what God has created. It’s a good feeling to make something for others to enjoy. 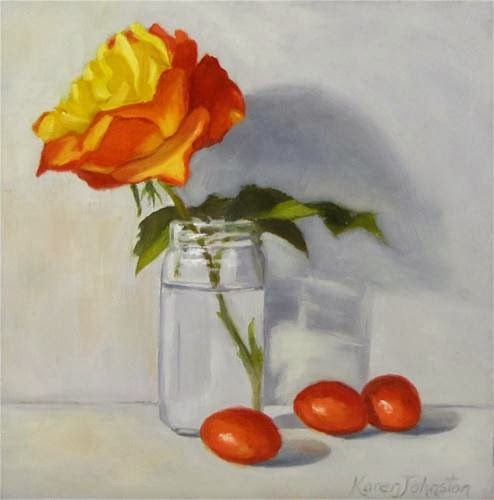 To enter to win Karen's painting, "Spring Celebration" go to Daily Paintworks and click on the link at the top of the page announcing her interview. I live in Napier, New Zealand with my husband. It's a great place to live and I love what I am doing everyday! I draw inspiration from my surroundings. I enjoy painting a variety of subjects to bring interest to life around me and share a way of seeing and feeling. There is beauty everywhere if you take the time to look. All my life I have been drawing, painting, or doing other creative projects. I started getting serious about painting a little over twenty years ago. A friend invited me to go to a pastel class and that was it! I decided I needed some paintings for our home we had just bought, so that was the start. From there I joined a local art club and took further lessons in watercolors and silk painting. Then, I studied part time for a couple of years to gain a diploma in drawing. The silk painting took over for a few years until I was introduced to acrylics and oils, the oils won out. I have been using them ever since, I love the smooth buttery texture. I slowed down a few times because of work and other commitments, but never stopped completely. I have tried pastel, pencil, charcoal, batik, silk paints, pen and ink, watercolor, acrylic and oil. My subjects are varied, I seem to do more still life, flowers, animals and landscape, but I have tried a few figurative paintings. Most mediums have fallen away. I still draw and sometimes use watercolor but oil is the one that has stuck. I would like to explore watercolors a bit more, I know it's not an easy medium but I think the challenge would be good for me. 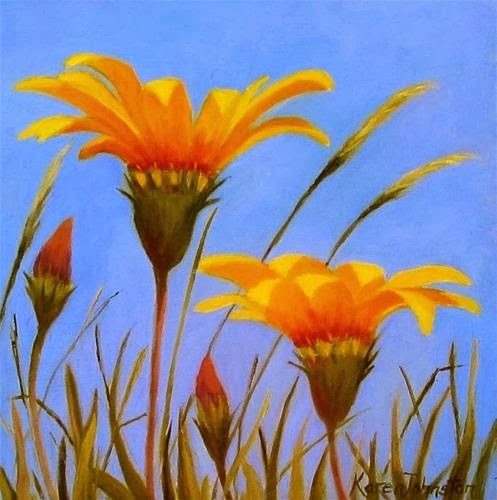 Kathleen Dunphy, she has beautiful light in her work. Also, Daily Painters Carol Marine, Karin Jurick and Qiang Huang; they were my inspiration for starting daily painting. Many things inspire me, but mostly light and color. Procrastination for me is having too many ideas running around in my head. I have to pull the reins and focus on what really excites me, I find that difficult at times. Being organized (most of the time) having set times and following a daily routine. I work best late morning until late afternoon. My ideas usually come from my surroundings in everyday life wherever I am. It could be when I'm out walking the dog, the food market or just around home. I may get an idea and follow it up with sketches or set up a still life, other times I take photos! I like different subjects and paint what I love and feel excited about, if I don't it just doesn't work! I change things around a bit as well, I will draw or paint larger pieces. Regular breaks are great to avoid burnout. Whenever I take a day off, I feel relaxed and energized, then I find ideas start to flow. I am learning to let go of things that aren't working and embrace the small things that make life worthwhile. I don't have to paint like anyone else and when I paint from my heart it's personal so I feel it's my best work. Just painting and being lucky enough to do what I love.